Yep, here’s another scammer number to add to the ever growing list! This one is from Jamaica of all places. That’s from WISTV10 website and Jackson County, IL and the sheriff’s office was actually issuing a warning about it. 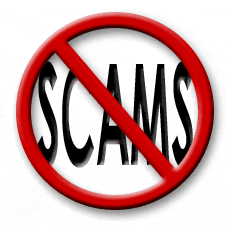 There’s several scams related to this one including you won money, you won a car, or there’s a delivery for you and you have to pay whatever amount to get it through customs or some such thing. The company that provides service for the number is http://www.digiceljamaica.com/ and I contacted them via email and filed a complaint and I actually got several responses back and forth between me and a very helpful representative. They actually promised to look into it for me and see what they can do about it. I’m not sure if anything will actually happen but maybe if enough people complain to them, they might do something about it. Feel free to add your experience to the comments below.. 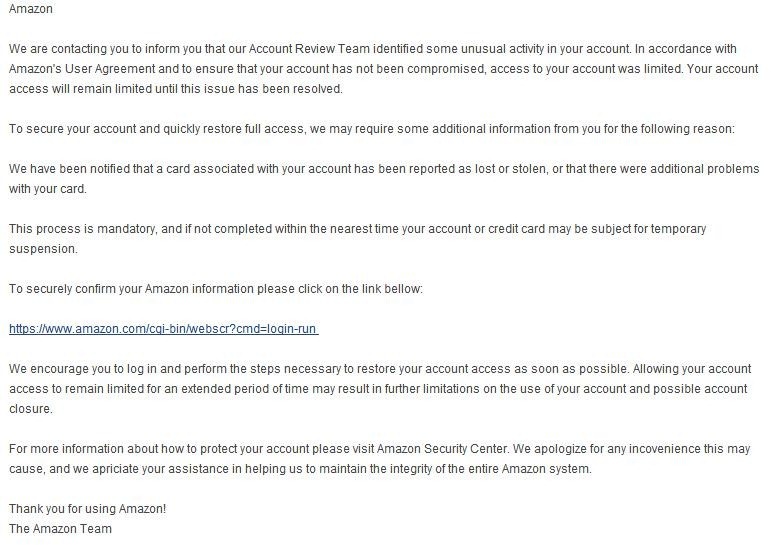 So here’s a new one, at least for me.. it’s an Amazon phishing email and it looks real only if you aren’t paying attention that is.. This just came in actually and it’s odd timing as I just ordered from Amazon about an hour or so ago. Then reading on you see a link to Amazon to fix the ‘problem’ but it looks funny especially with the whole ‘login-run’ thing at the end. I don’t think I have to say this but I will anyway, don’t go to the above link!!! Which is obviously not Amazon. Yeah, so make sure you read your emails carefully and don’t click on anything or else you could get yourself into quite a bit of trouble!! 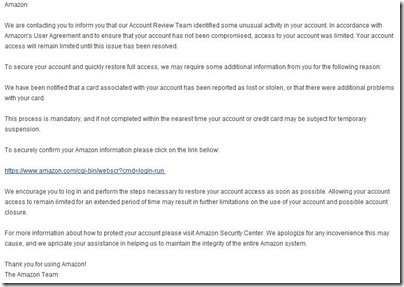 Please be careful, I’m sure many people have fallen for this already as it does look real….